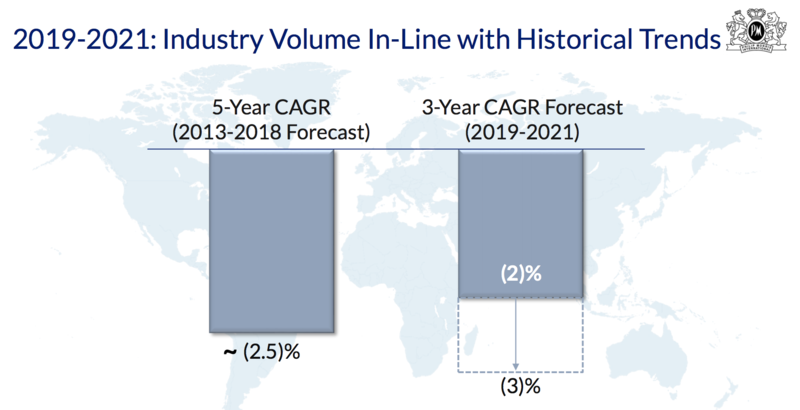 Philip Morris markets its cigarette brands to more than 150 million customers in over 180 countries and has close to 30% international market share (excluding China and the U.S.). That’s largely due to selling Marlboro, which is the No. 1 cigarette brand in the world and accounts for approximately 35% of the company’s total volumes. While traditional tobacco products still generate the vast majority of the company’s profits, reduced-risk products, or RRPs, now account for about 13% of sales and are growing rapidly (by 2025 management aspires for RRPs to account for 40% of the firm’s revenue). These products also carry higher margins because they have lower taxes compared to traditional cigarettes. Geographically, the European Union (35% of sales, 36% of income) and Asia (29% of sales, 39% of income) are the company’s most important regions, followed by Eastern Europe, Middle East and Africa (23% of sales, 27% of income) and Latin American and Canada (13% of sales, 10% of income). A key factor supporting Philip Morris’s pricing power is the firm’s focus on premium brands, which accounted for just over 50% of the company’s 2018 volume (compared to less than 30% for the industry). Studies have also shown that premium brand smokers are less likely to quit, helping cushion the company’s exposure to a powerful secular decline in global smoking rates. 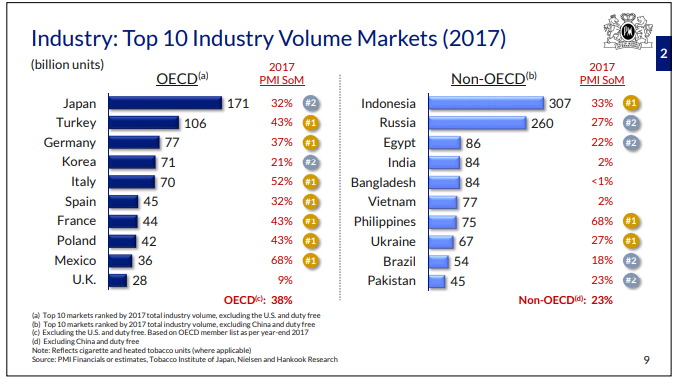 One of the reasons for the cigarette volume declines in recent years is higher government taxes in some of Philip Morris’ largest regions, such as the EU, Russia, and the Philippines (three of the company’s top four markets). That’s part of a concentrated effort by governments around the world to reduce smoking rates which can be up to five times higher than in the U.S. according to the World Health Organization. Overall, excise taxes account for around 63% of Philip Morris’s total revenue today, up from 59.5% in 2012 (and more than double Altria’s level). Fortunately, that figure has stabilized in recent years, thanks in part to the company’s big push into RRPs which are likely benefiting from lower taxes compared to cigarettes and more lenient marketing rules. While Philip Morris’s operating margins have declined in recent years due to rising taxes, unfavorable currency exchange rate fluctuations, and investments in RRPs, the company has managed to use aggressive cost-cutting to lessen the blow. A lot of this success has to do with the industry’s favorable qualities and Philip Morris’s competitive advantages, driven by the company’s excellent brands and pricing power. RRP volumes have grown quickly thanks to the company’s aggressive worldwide rollout of its heat sticks (especially IQOS). The initial effort was mostly focused on Japan, which is the world’s leading RRP market thanks to unique anti-vaping regulations (nicotine liquids are classified as pharmaceuticals). This caused many tobacco users to quickly switch to IQOS. Philip Morris has taken what it’s learned in terms of marketing and distributing RRPs in Japan and applied that to 37 other markets, such as the EU, South Korea, and Russia. 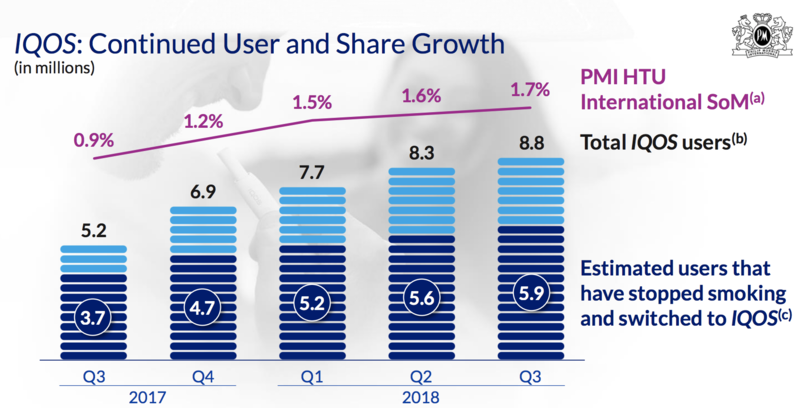 As you can see by the rising purple line below, IQOS is gaining share of the total industry sales volume for cigarettes and heated tobacco units (HTU), excluding the U.S. and China. Management is banking on growth in heated tobacco to help offset continued volume declines in cigarettes. In the first nine months of 2018, Philip Morris’s heat stick volumes grew over 40%. While they represent just 7% of total company volumes, their strong growth rate helped buoy the firm’s overall volume decline to outperform the broader industry. Even better, IQOS is a higher-margin product for the company since it is not (yet?) weighed down by the steep excise taxes placed on traditional cigarettes. As a result, the company could maintain its strong profitability for many years to come if heated tobacco products take off, helping the firm’s bottom line continue growing even if the overall cigarette market experiences a more severe volume decline. Simply put, the importance of IQOS to the company’s long-term future can’t be understated. However, as management notes and the market share chart above confirms (just 1.7% share of the overall industry), we are still in the early stages of RRP adoption. Growth could increase or slow any given quarter, creating some anxiety for investors who are nervous about the tobacco giant’s ability to thrive in a smoke-free world. Management’s big bet on RRPs like IQOS is being made with the expectation that by 2025 they will account for over 30% of company-wide volumes (up from 4% in 2017) and about 40% of net revenues (up from 13% in 2017). If successful, that should help the firm maintain steady revenue and earnings growth despite the ongoing decline in cigarette volumes. It’s also worth noting that at the end of 2016 the company submitted a product application for its IQOS product to the U.S. Food and Drug Administration (FDA), hoping to open up a large market opportunity. The FDA has yet to approve the sale of IQOS in the U.S. but has said that Altria and Philip Morris won’t be able to use a reduced risk label on these products. That could limit the success of IQOS in the U.S. and thus any royalty payments the company can expect from its partnership with Altria. However, the early traction is encouraging as Philip Morris looks to gradually shift its business from being a manufacturer of combustible tobacco products to an RRP-focused company. The firm’s early mover advantage in global RRPs, massive distribution channels, solid brands, and pricing power are all important assets as it adapts for the future. What’s more, Philip Morris’s strong success in RRPs in recent years could be unsustainable. Most of its growth was fueled by rapid IQOS market share gains in Japan, where the company dominates with 80% RRP market share. While Japan is just one of the dozens of markets where IQOS is sold, it’s unfortunately the most important one today. In fact, Japan represents about 90% of the global $5 billion heat stick market, according to Euromonitor. There is no guarantee that heat sticks like IQOS will see strong enough global adoption compared to its main rival, e-cigarettes (vaping). In other words, the company’s ambitious goal of generating 40% of it 2025 revenue from RRPs might not be achieved. The substantial amount of money Philip Morris is investing in RRPs may not earn the return management expects. And as for the prospect for IQOS in the U.S., which has long served as a potential growth catalyst for Philip Morris, there is risk here as well. Specifically, Altria’s recent $12.8 billion investment in Juul (it now owns 35% of the leading vaping company in the U.S.) might minimize IQOS growth in this country, even if the FDA ultimately approves the product. While Altria has said it plans to aggressively market both Juul and IQOS in the U.S., after paying such a steep price for Juul (over 30x sales), the company has taken a lot of heat. As a result, Altria’s management likely feels a lot of pressure to prove its Juul investment was a wise strategic move, so it may focus more on Juul products rather than marketing IQOS. As a result, continued cigarette price increases and financial engineering (i.e. reducing share count over time) may become increasingly important components of Philip Morris’s long-term earnings growth, especially if RRP market share gains require price wars as the company has seen in Japan. If you are willing to overlook the secular decline of the overall tobacco industry and don’t have moral misgivings about investing in an industry whose products ultimately harm its customers, Philip Morris International has the potential to be a decent high-yield investment for a diversified retirement portfolio. While many international markets have demonstrated higher volatility in recent years due to new legislation, currency movements, and more, Philip Morris’ long-term prospects still hold potential. Specifically, the company continues seeing traction with its high-margin reduced-risk products, which could fuel market share gains and solid profit growth for many years to come. Investors just need to keep an eye on global cigarette volumes to ensure their rate of decline doesn’t accelerate.